From our camp we watch the baby hippos slosh around in the nursery while the adults watch us suspiciously. Sammy our cook prepares scrumptious meals that we devour between our safaris. 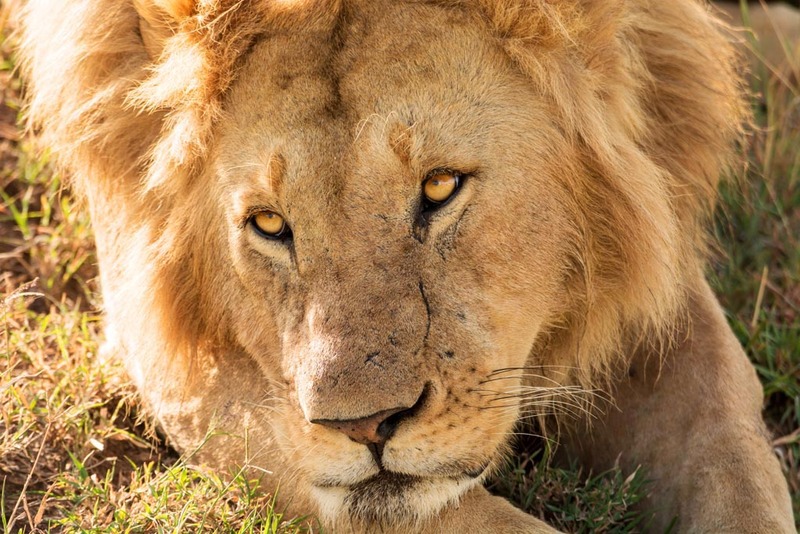 Our days are filled with game drives action-packed with wildlife, and nights are spent around the camp fire until we retreat to our tent to the echoes of the roaring lions… We are camping in the Masai Mara, a private safari with just the two of us, our guide and cook. When planning our trip to the Masai Mara, we search for accommodation and safari lodges until they blend into one and all look the same. We decide to experience something different and plan our own private safari and camping in the Masai Mara. 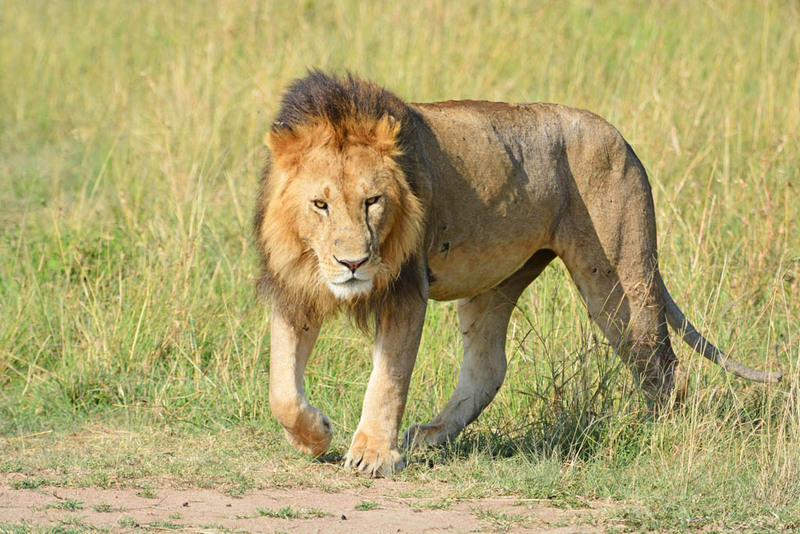 After months of communicating by email with Martin our guide in Nairobi, we have the perfect itinerary for camping in the Masai Mara. Martin has everything organised; our landcruiser, private campsite, camping equipment, our cook Sammy and the food. It is a rough and dusty 6-hour drive from Nairobi to the Oloololo gate. Closer to the Masai Mara, the rural towns are replaced by traditional mud hut villages, where Masai children play, men tend to their goats and livestock, and women collect firewood. Buffaloes and zebras graze on the open grasslands, and giraffes munch on acacia trees near the river outside of the reserve. 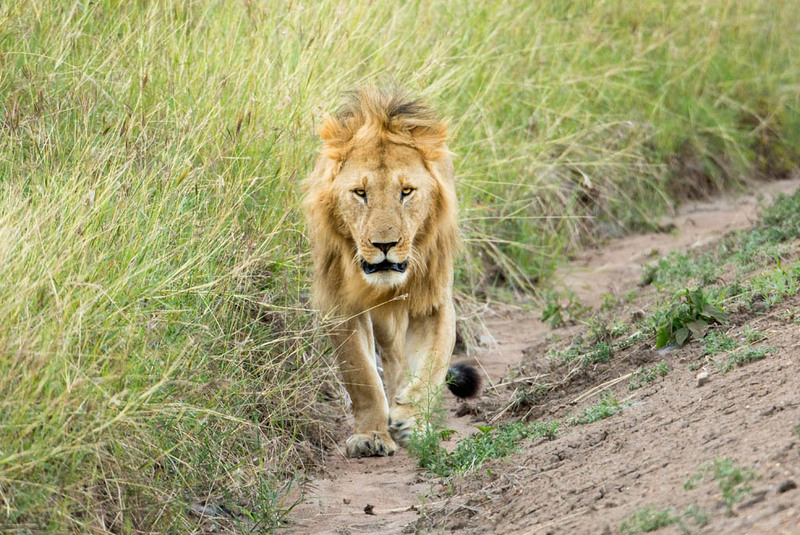 Not long after entering the gate, we see our first lions. 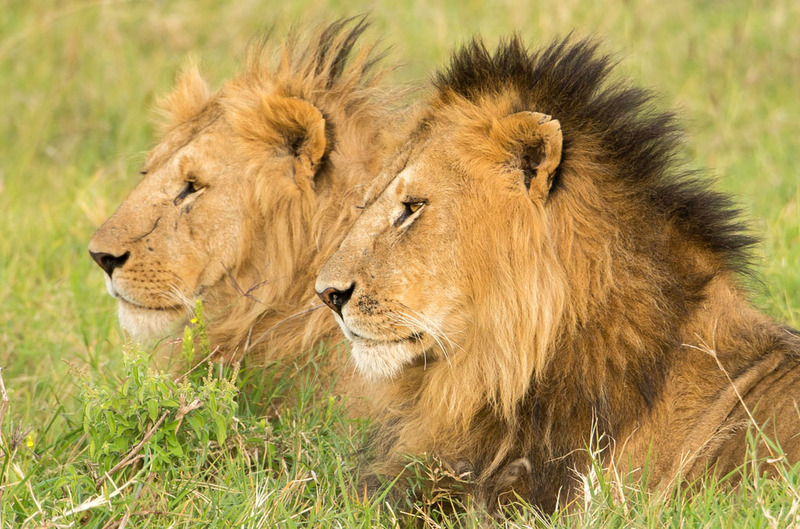 Two males sit together and further up a male and two lionesses sprawl out in the long grass. So laid back they barely bother to open their eyes. Knowing they are not likely to move in the middle of the day, we decide to set up camp and return in the afternoon. Heading towards our campsite we don’t know what to expect, so can’t believe it when we pull up on a steep river’s edge. 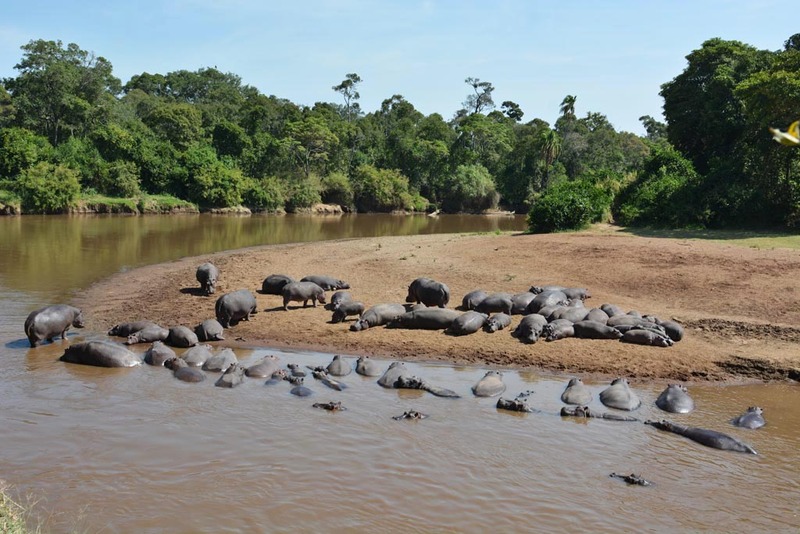 Below is a hippo pool and hippos are everywhere across the Mara River. They sunbake on the river bank and wallow in the dark murky water below. 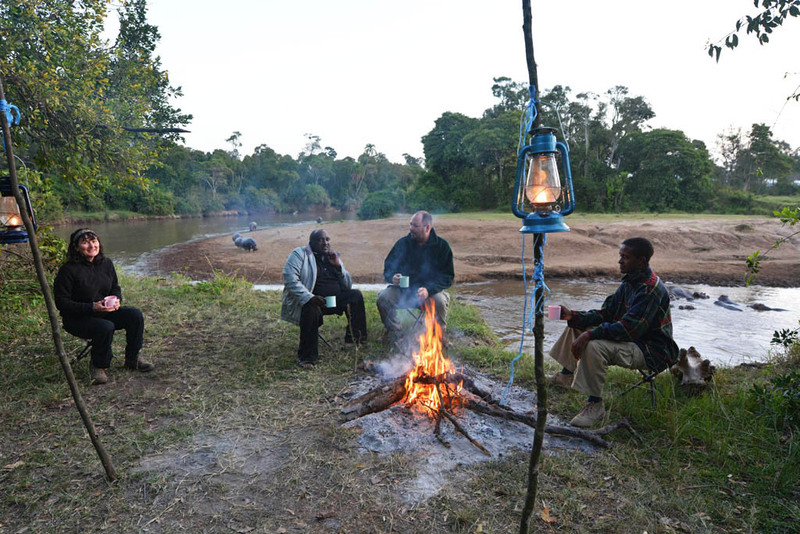 Ndovu campsite is private and restricted to one group of campers at a time. It is a bush camp, so there are no amenities. This is real African bush camping! The site is perfect; there are ample trees so tents have shade while there is also an open space for a view of the river below. We pitch our tent so that it has a view over the hippo pool. Martin and Sammy are not sure about being close to the edge, so they set their tents up behind us. In the afternoon, we go in search of the lions. The male is in the same place, but his two girls have gone. He dazedly lifts his head, wrinkles his nose, and sniffs the air, perhaps trying to trace his girls, or maybe he can pick up a whiff of the buffaloes. He is unaware the buffaloes in the background are on to his scent, and hundreds of them form an arrowhead and work their way towards him. The buffaloes are enraged and in pursuit of him. When he realises what’s happening he loses his cool composure and panics. He runs towards us and off down the road. Cheeky and cute baby elephants approach our vehicle. A baby elephant, who earlier was mock charging the vehicles, joins the buffaloes in chasing the lion. He raises his little trunk and heads the charge when the lion is in retreat. This is one tough baby! He seems so pleased when he goes back trumpeting to his family. We think he is the dominant male out of the three. 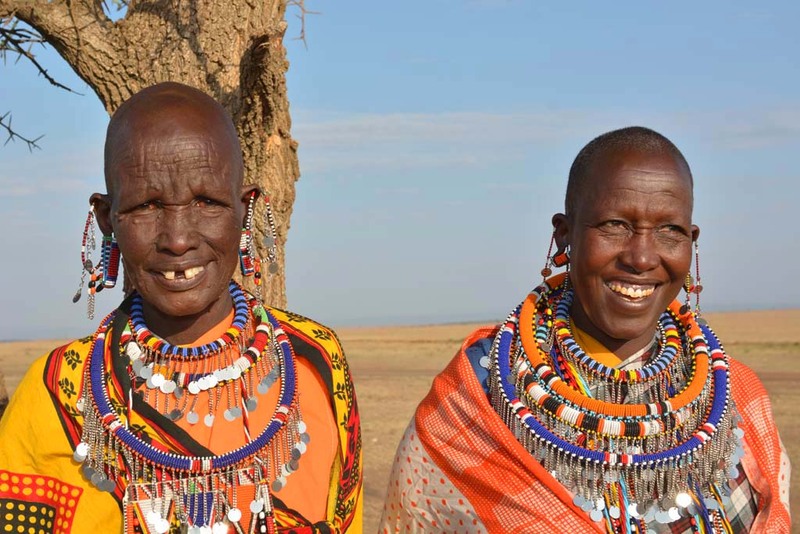 Back at our camp, we meet our two local Masai Mara guards. It is compulsory while camping in the Masai Mara to employ them. They protect the camp from wild animals at night. After Sammy’s delicious cooking, we sit around the fire with beers and watch the silhouettes of the hippos and crocodiles below. We talk about our first day and don’t think another day can compare. Brothers in arms. These lions look after the dominant male with the sore paw. The next three days are as good as the first. 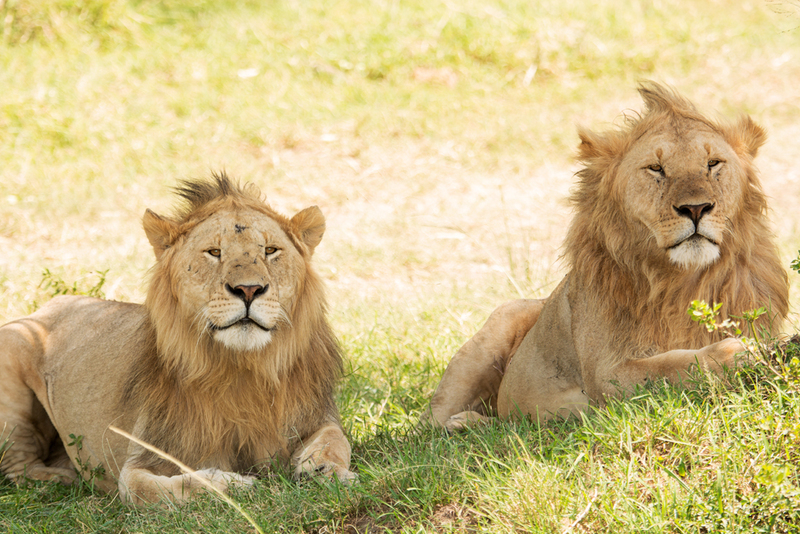 We see lions every day, including a bachelor group where the dominant male has a sore paw and the two younger males (who look like brothers) care for him. Before we leave we notice his paw is getting better. 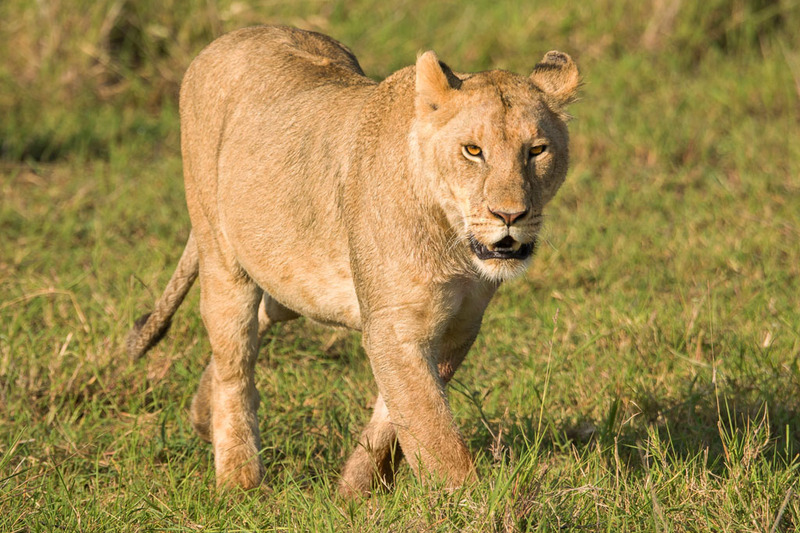 Because of the wounded lion, the group doesn’t go far and we track them each morning. The lion with the sore paw rests in the shade while the other two keep alert and watch over the savannah. Over the next few days, we get to know them and watch the older lion go from barely being able to walk to limping around. 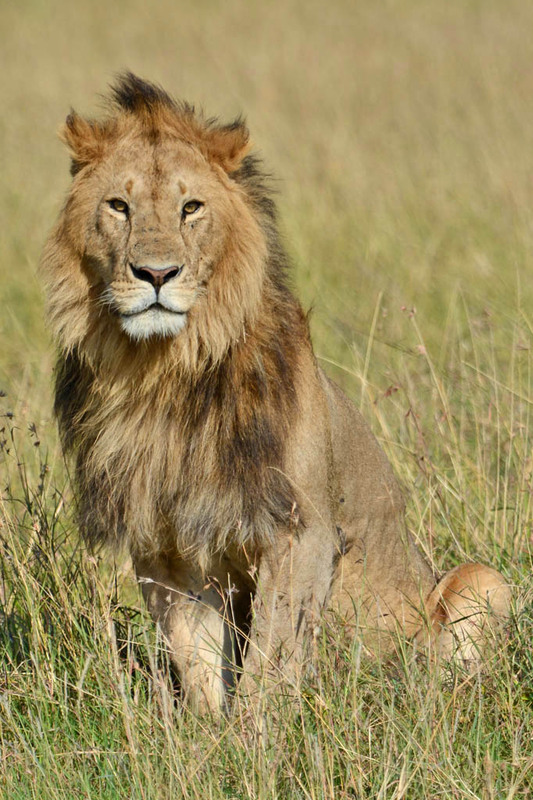 In a couple of days, we learn a lot about the individual lions. 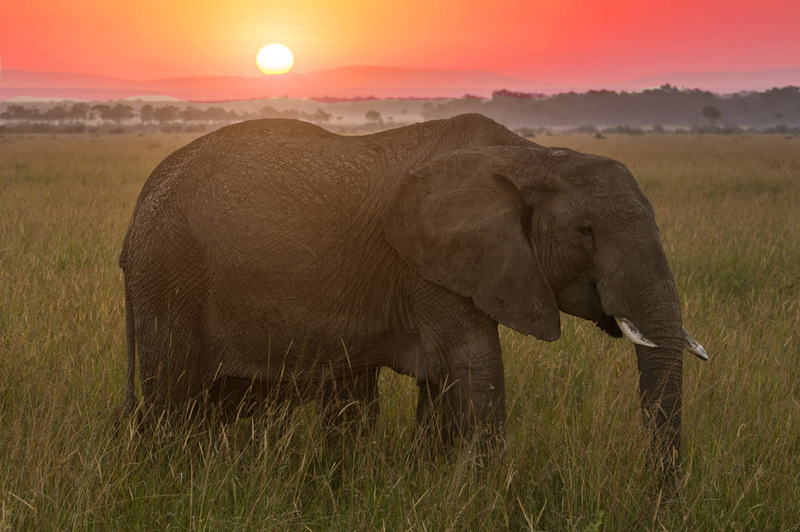 We see elephants at sunrise and some in a mud bath. Every day a young bull discreetly follows a lone mother and a young elephant, who we think is her calf, from a safe distance behind. He cuts a lonely figure and probably had to leave his family group and wants to join the mother and her baby. We also feel sorry for the mother and baby and wonder why they don’t join a herd. 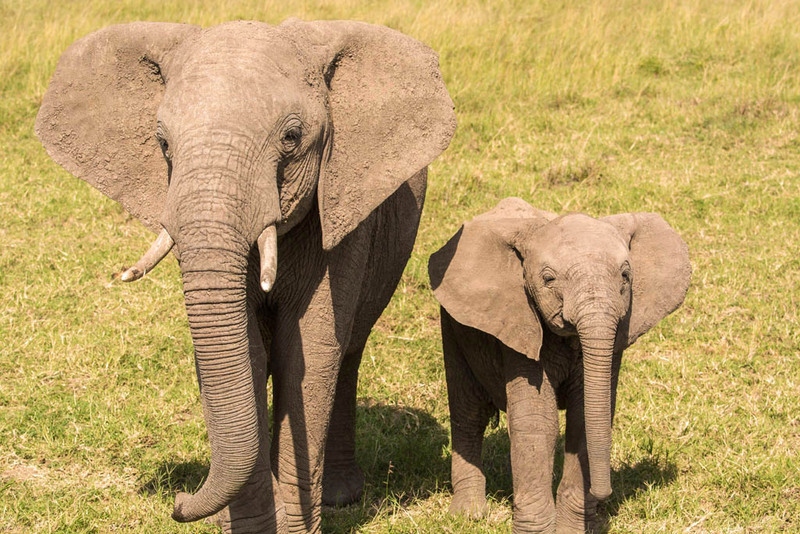 We feel sad for these two elephants. They are always on their own and never join a herd. 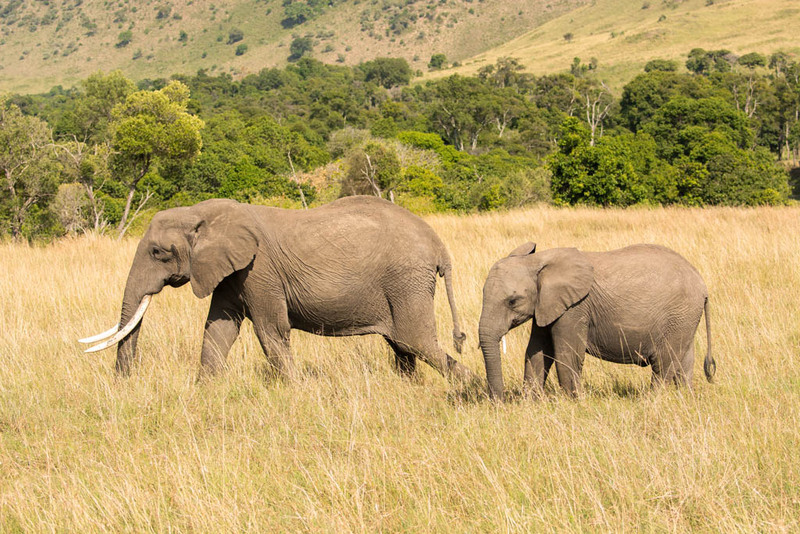 There are many baby elephants, but sometimes they are hard to see because the elephants love the long grass, and it’s often taller than the babies. Some elephants are very curious and come right up to our vehicle, whereas some show aggression, especially the bulls, and do not like the vehicles at all. A herd of impala surrounds a sleeping lion in tall grass. They know he’s there but don’t flee because it’s better to know where your enemy is. The lion doesn’t move as he knows the game is up. He’s been spotted, and his chance is gone. The impalas eventually settle, but three of them stay on security duty and watch him. This hyena was on the road. 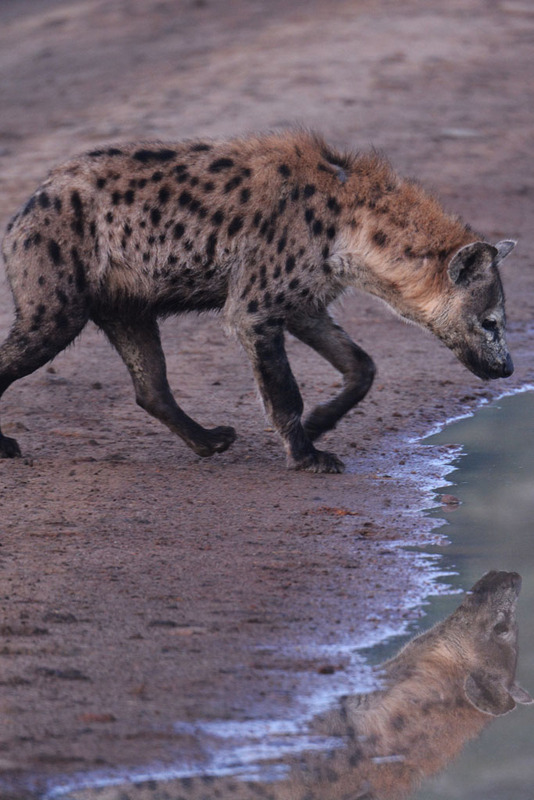 Hyenas love water and sometimes we catch them playing in the puddles on the road. A hyena pup is out, and when he sees us, he makes a dash back to his den, but it’s right beside the road. His mum won’t let him back in as he’s not supposed to give the den away, but he’s eventually allowed back in after he circles around for a while and we move away. A pregnant cheetah surveys the savannah landscape from some rocks and we wish so much we could be here when she has her cubs! No predators or prey are in her sight, only a beautiful giraffe family munching on acacia leaves. 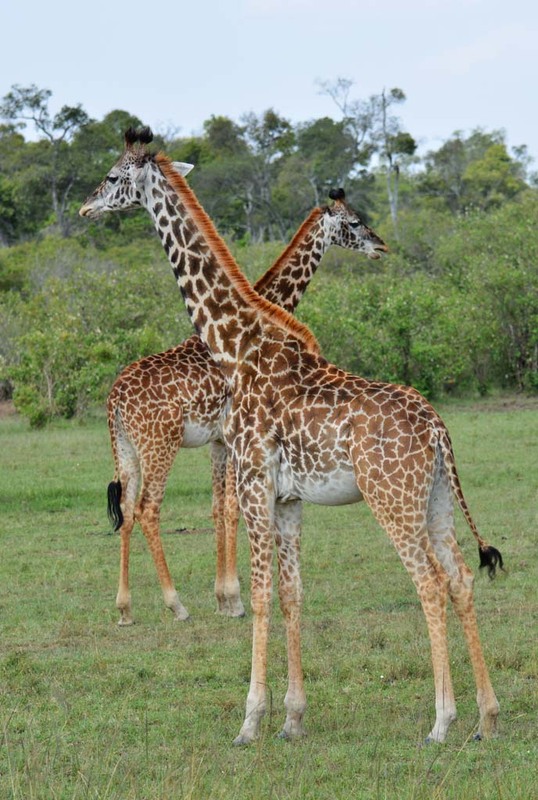 The beautiful giraffes are a part of the scenery. As if the game drives are not enough, it is hard to leave our camp at times because wildebeest and zebra come down to the river to drink. 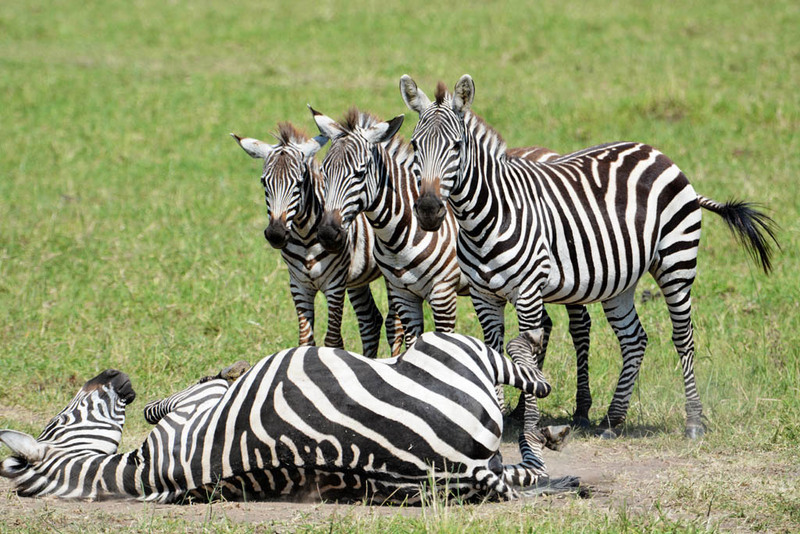 We hear the barking of the zebras before we see them, and from our camp, we watch nature at its very best. They are so restless and we wonder if they attempt to cross the river, but they only drink and leave. Some so nervous that they don’t even get to quench their thirst. The hippos splash slothfully and lay in wait to bluff the wildebeest and zebras. They don’t like sharing the river so they charge, and the anxious zebras and wildebeest flee. Some braves ones call the hippos bluff and turn around. This surprises the hippo and he runs fast and clumsily back into the river. View from our camp. 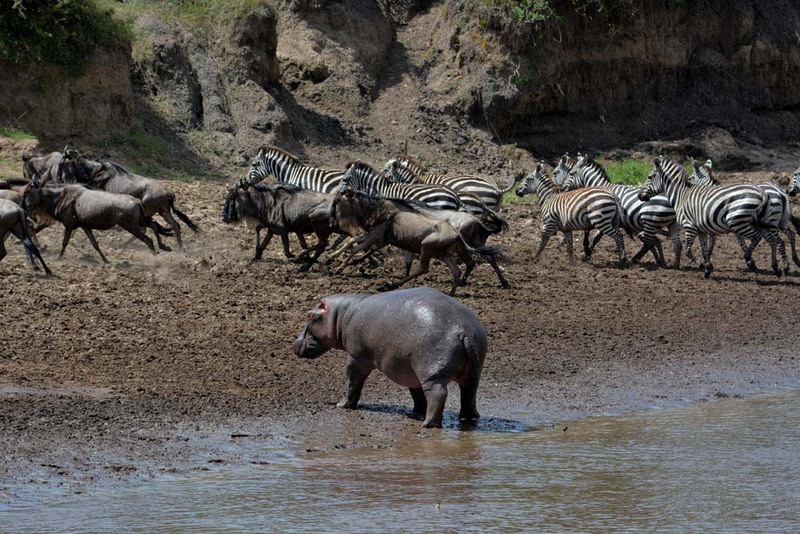 Hippo chasing the zebras and wildebeest. Night time is an experience in itself because of the wild sounds of roaring lions, giggling hyenas and startled calls of wildebeest drifting in with the cold savannah breeze. Close by we hear the farting, water bubbles, grunting and gurgling of the hippos which are not far below us. In the morning, our guards tell us lions we hear at night came in so close to our camp that they see their silhouettes in the moonlight. We see lions every day. We leave a different world behind when we drive out of the gate as never a day goes by without witnessing amazing wildlife encounters. 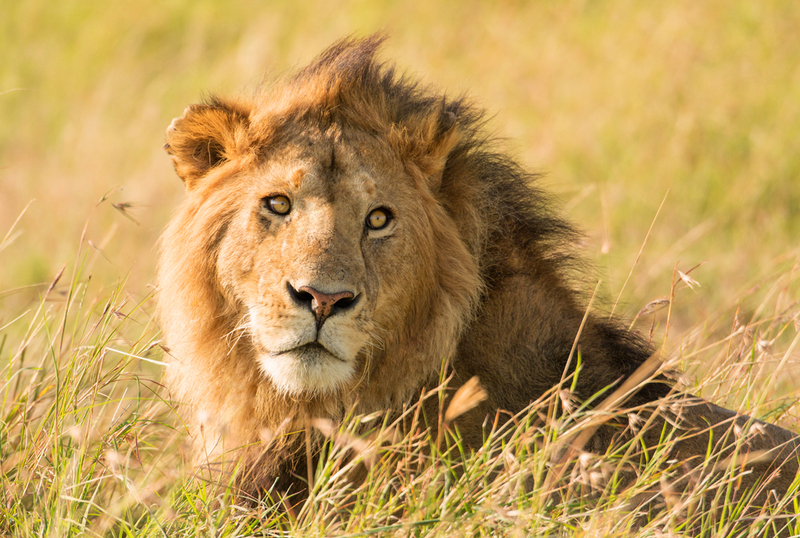 A visit to Kenya’s best wildlife reserve (and possibly the world’s) and camping in the Masai Mara is something everyone with an interest in wildlife should have on their list. 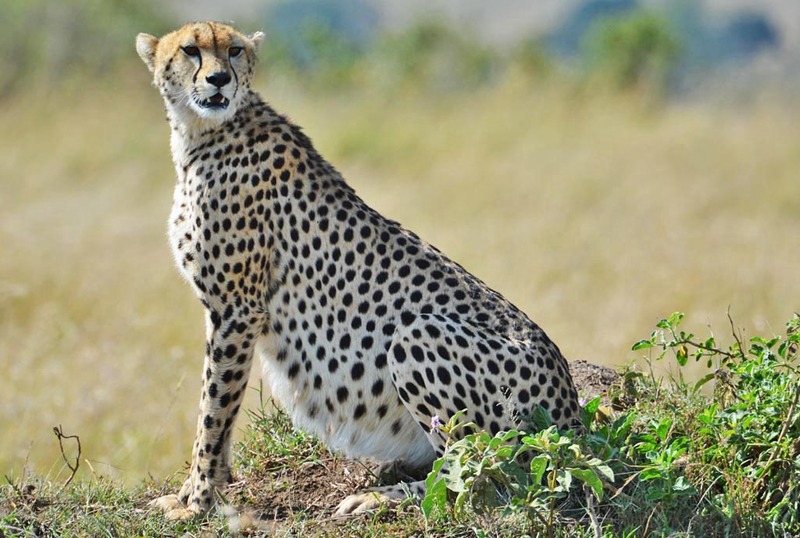 Masai Mara Park Fee $280pp – This is the park fee of $70pp per day which is required whether camping, staying in accommodation or on safari. Ndovu Campsite $115 (Private camp) – Exclusive booking which is for the entire campsite and one group of campers only. Camping fee $40pp – General fee for camping in the park. 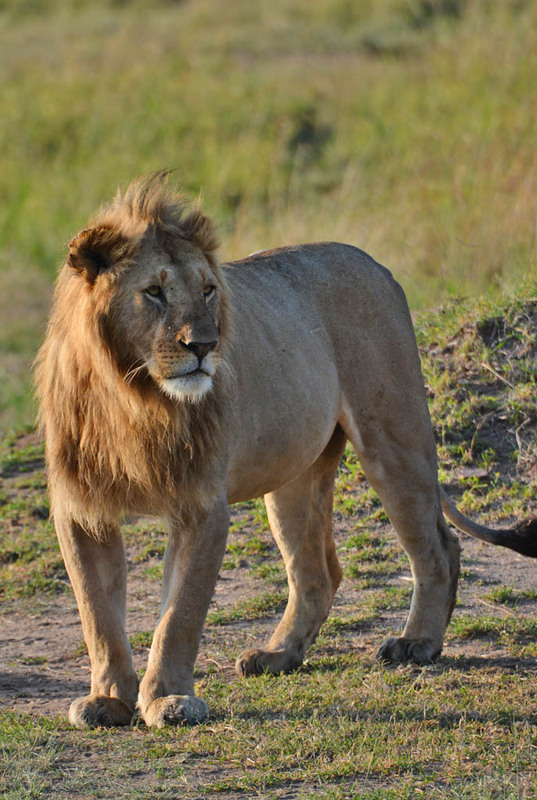 Masai Mara Guards $200 – It is compulsory while camping in the Masai Mara to employ local guards at night. Vehicle 5 days $700 *Landcruiser Troopcarrier. However, this is a large vehicle and cost can be reduced for a smaller one. *Camping site, Camp fees & Masai Mara guards to be paid in Kenyan Shillings. The total price per person is about US $1300. This includes all the game drives for when and however long we want. We leave a different world behind. Thanks for your comments Barbara. Africa is an amazing destination. We are already planning our next trip! If your daughter has any questions just get in touch with us. Outstanding pictures Ray & Sue, and we love the stories that go with them! John and I really wish to visit Africa and you pictures inspire us immensely. We love seeing your wildlife travel pictures in exotic places and reading about your adventures. Looking forward to your news ones! Shannon & John we are glad to inspire you. We love Kenya so much and have so many memories of a lifetime.If there’s anything you want to know get in touch with us. Thanks for your commments we appreciate them very much. Gorgeous memories from a life changing trip! Appreciated the honest description of the night “sounds”. Something I have never heard before but found interesting. Thanks so much for your comment Vicky. We loved listening to the all the night sounds of the wildlife. That’s why camping was so awesome. It was all part of the experience! We are glad we can take you back to your memories of the Masai Julie. Camping was a great way to experience it. We were in the middle of everything! And to top that off we had the best guide imaginable. You certainly make ‘camping in the wilds’ a reality for us all! If ‘a picture says a thousand words’ then your words graphically transport us to the nail-biting atmosphere of ‘sleeping?’ in a flimsy tent, listening to lions roar! And make it sound like a walk in the park. I am shaking my head because your enthusiasm even makes me want to try it! You interpretation of this so natural world of wild birds, great beasts and carnivores is so intimate it brings them to life as personalities. Your blogs are incomparable. Well done. They should be on educational programs. Have you ever considered doing documentaries in video? at the very least you should be in travel magazines ! Thank you for your comments Gypsy.To us there is no other way to experience the Masai Mara. 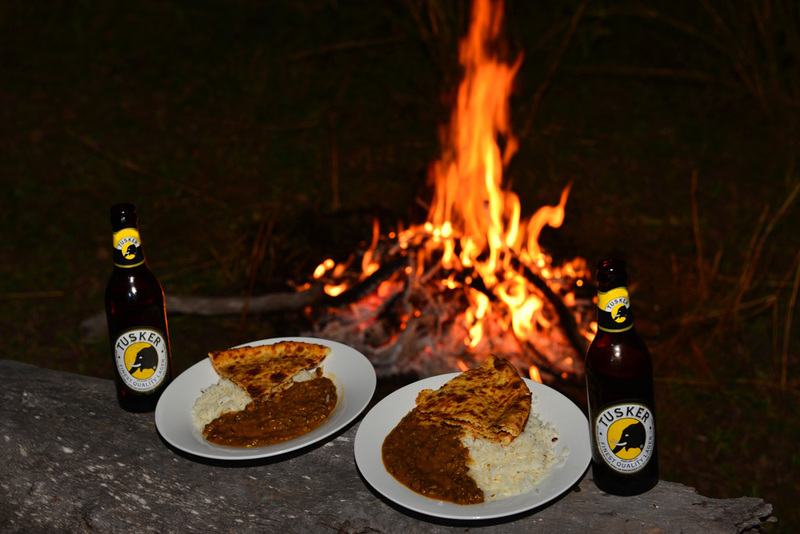 This is what a camping safari is all about! 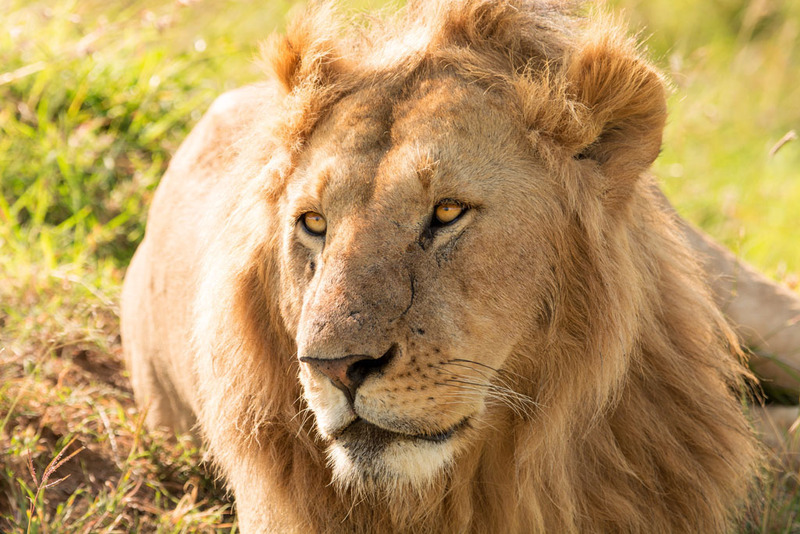 Listening to the Lions roar and other wildlife was all a part of the experience. It was magical. We are going to start taking videos in the future so keep your eye out for them! Waw!!! Only discovered your website now and i’m truly amazed by all the beautiful pictures it contains!! Your comments are also very nicely written and only makes us feel like we’re part of the trip. I need to take a better look at all those pictures when i’ll have the time and wonder if you’d send one of them over to France in case i’d like to buy one?? I don’t have any words to praise your work and blog related to travel and wildlife across the globe. It is definitely one of the best travel blog for photographers and extreme travellers. Searching in the google, I came to know about your website. Such a pleasure to browse through it. I specially like the clear cut informations about Camping,budget and lot more.Being a travel freak person and a budget friendly guy,I always wanted to gather information by which I can travel many places across the world and also good chance of quality photographs. I am really overwhelmed by the information in this blog. For example, I have never been to Kenya/Masai Mara. Every photographers dream is to go there. Now, If I plan any photographic safari ( with professional photographers) for 10 days or so, it cost huge amount. I need the location and sightings, I can click images properly. I don’t need any photographers advice to show me how to “click images” – at least in Masai Mara. I can gather the info in my local area quite easily. Now, if I see your Kenya blog, you have mentioned Camping option. Rent a car, take a good guide who knows everything – all will be done. You have provided some budget informations also. People like me ( and I know many others) get a lot of information and idea about that and they can plan accordingly. My Sincere thanks and regards to you for such a wonderful blog. Wow! Thanks for your comment Ari! Camping in the Masai Mara is a great option and one of the best for photographers. Our guide Martin was also the very best! In just a couple of days we saw so much wildlife. Because it was just us on a private tour, it was up to us what we did and how long we spent with the wildlife. You just don’t have this freedom and flexibility with big tour groups. We highly recommend this Ari. Thanks for this overview. Great adventure and amazing pics. Never mind the price but its all worth to see how those living creatures live at their own. Thanks Edward. It was a great trip, and camping lets you get that so much closer. We saw a lot in only four days. He is fantastic. Yes, we could stand up in our tents though they were very basic. It depends on your budget what sort of tent Martin will hire. Just let him know what you want and he will let you know the cost. Hi Christine. We had a small bush shower and our toilet was a typical African bush camping style of toilet that you dig a hole dug in the ground with a shovel. Transportable toilets can be hired, but they are expensive for a small group because of the logistics of transporting and emptying. Any camping equipment can be hired, it’s a matter of how much you want to pay for it. Our camping trip was by no means luxury, but it was a chance for us to go private with only the two of us, have our own guide and cook and do whatever we wanted. Explain to Martin what you want and he will do his best to make it perfect for you. Great camping safari. Thanks for sharing. That is very inspiring Ray and Sue. Glad that you had a great time in your stay..Kenya indeed has exceptional diversity.Great photos there!! Hi Lisa, Thanks for visiting our website and your comment. 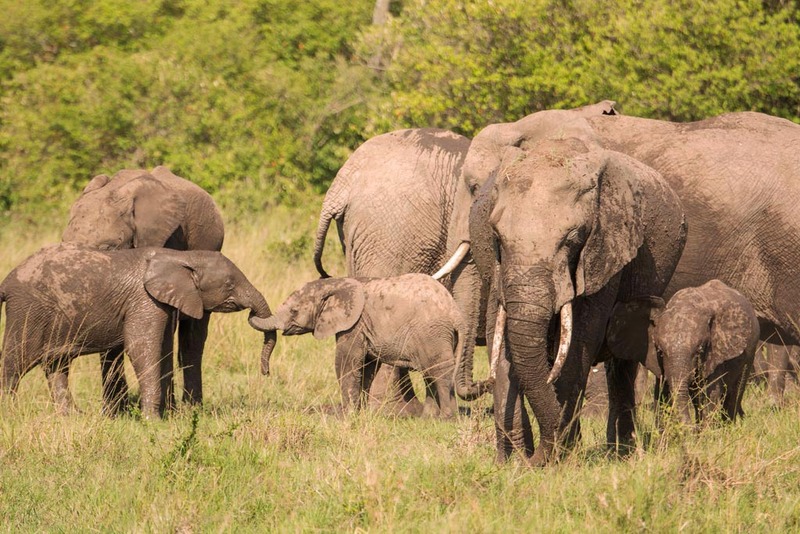 The Camping in the Masai Mara Park Fees ($280pp) – should be the park fees only. This is the fee of $70 which everyone pays whether camping, staying in accommodation or on safari. Ndovu campsite ($115) – the cost of booking the entire camp. Camping fee ($40pp) – the general fee for camping in the park.